How to get there: Two trailheads are described below. La Marmora is an European Ultra that can be climbed without much effort if so desired. However, to conform with a minimum 600 meter vertical ascent rule, special attention is required and trailhead A below should be used. 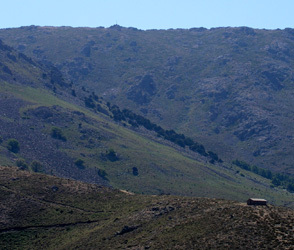 From the north, drive to the village of Fonni from Nuoro, for example along Hwy. 389. From the south, drive north to the village Desulo. Follow the main hwy. through Fonni, going uphill and find signs for Desulo. The distance between the two villages is 24 kilometer with somewhat narrow and very winding road. However, before the road starts descending to Desulo, you arrive at a col with several side roads. The last road forking off, goes left. Take this road to a new intersection at the col named Arcu, elevation 1121 meter, location N40:00.084, E009:15.300. From Desulo, a small road forks right just as the main road through town makes a distinct turn left in order to continue climbing towards Fonni. The hotel Lamarmora is located at this spot. Drive this road until you arrive at the col named Arcu, elevation 1121 meter, location N40:00.084, E009:15.300. From Arcu, head south (downhill), but only a very short distance before you locate a smaller road that forks left from the road you are on. Take this road and drive it into the first valley, turn right and climb around the first hill in order to enter the main area below Marmora. As the road starts to climb again, find parking near a left turn where a smaller road forks off to the right. This is the trailhead, elevation 1206 meter, location N39:59.716, E009:17.525. One may continue further along this road across another hill, then descending into the last valley before the slopes of Marmora. The road gradually gets worse, but it may be driven to the last hut/building at elevation 1487 meter, location N40:00.099, E009:18.790. 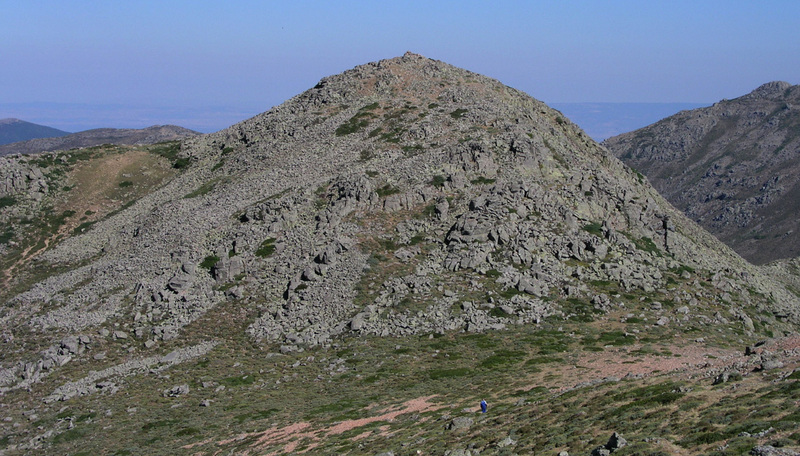 Note that in this case the vertical distance to the summit is only 347 meter and this does not qualify as a proper climb of an European Ultra Prominent Mountain. Take the road towards Desulo as described above. After about 5 kilometer, locate a road that forks left with signs for Monte Spada and/or Bruncu Spina. The trailhead is approximately 1 kilometer before the end of this road where there is a dirt road going right and some parking on your left. From here, one can hike along the main mountain ridge and easily get to La Marmora. Note however, that this trailhead is MUCH too high for the climb to satisfy any vertical gain rule as required to do a proper climb of an European Ultra Prominent Mountain. From Desulo, drive in the direction of Fonni. After about 19 kilometer, locate the road that forks right with signs for Monte Spada and/or Bruncu Spina. Then follow the directions as given above. Recommended accommodation: The Hotel Cualbu (tre stars) in Fonni is highly recommended, also by my wife that did not do the hike, but wanted a good place to stay. The internet address is www.hotelcualbu.com, email: hotelcualbu@tiscalinet.it, phone: +39-078457054. Classic Italian, a sort of hotel that is not being built anymore. Good restaurant and a nice garden with a large pool. Route description: This description covers a hike with a bit more than 600 meter vertical ascent from the Desulo trailhead as described above. From the trailhead, either follow the dirtroad uphill, then steeply downhill, then uphill again until it ends, or contour around to your right, perhaps slightly uphill into the small valley that cuts in between the trailhead and the proper slope of La Marmora. There are small animal trails that can be followed most of the way. One may further go more or less straight uphill instead of following the road, trading distance with off-trail hiking. Regain the road higher up and foollow until it ends. From the end of the road, either follow a big trail uphill to your left, or head straight uphill to the pass that you see on the horizon. Either way, you will merge with a trail that originates at trailhead B, this trail more or less follows the main crest of these mountains. This last main saddle before (north of) La Marmora has elevation 1658 meter and location N40:00.097, E009:19.161. The trail then crosses 40 degree south at elevation 1686 meter and location N40:00.000, E009:19.213 before reaching a minor col just north of the final summit ridge. 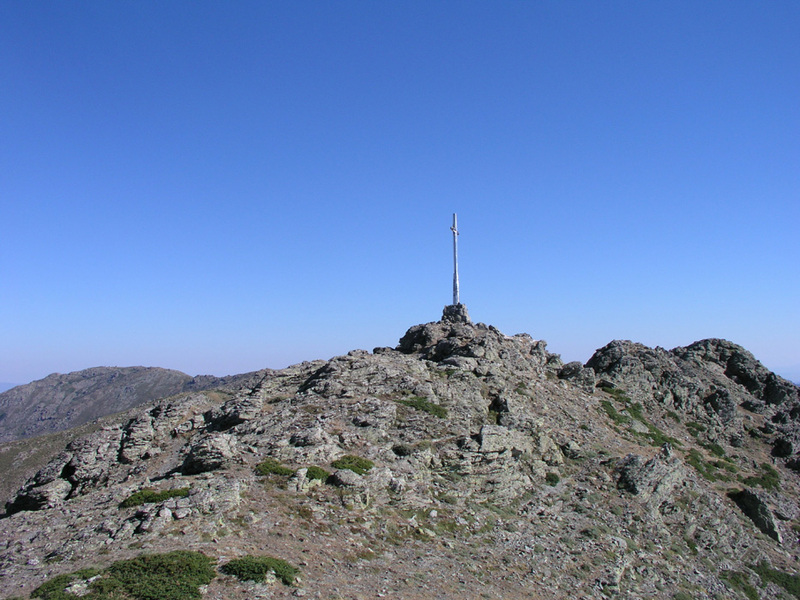 There is a cairn with a large metal cross. Proceed along the ridge to the small cairn about two hundred meter further south, this appears to be the highest point on the mountain. Comments: I did this climb with my son Pål Jørgen, age 16. This turned out to be a rather confused climb, clear evidence that hiking any mountain without a topo map can spell trouble. We had arrived from Corsica the previous afternoon, not even a roadmap of Sardinia (Sardegna) could be found there. In Sardinia, we succeeded to buy a roadmap, but searched without success for a topographical map. Having arrived in Fonni, we decided that the roadmap and our GPS summit coordinates would have to suffice. At the hotel, I found out (from the roadmap) that the trailhead served from Fonni, starting north of Bruncu Spina (1829m), was indeed much to high to count as a climb with a 600 meter vertical requirement. In fact, the entire ridge was above 1250 meter, so any approach from the north would involve a very long hike along the road (way too long). That left us with the Desulo trailhead, I had read that one should go to Dusolo, then up to the col Arcu Guddetorgui at 1121 meter, from where a bad dirt road continued part way up the mountain. This seemed near perfect as we could just park at the col and hike from there. This climb was not easy as thick brush soon caused difficulties, but a good fight got us above this area and the slope finally became more gentle. Big, bad surprise! There was a valley between us and La Marmora, the dirtroad had climbed around the ridge we had climbed, then descended into the valley. So much for a roadmap without contour lines. The dirtroad clearly went lower than where we had parked before ascending on the slope of Marmora. We had little choice but to descend quite some vertical in order to reach the road far below. Finally there, I decided that our best option would be to run back to the car along the road (initially uphill), then drive it further along and define a new and better trailhead. Thus, after wasting 1.5 hours of hiking/running we finally started out from a natural road fork at 1206 meter, at 0730. This time, things evolved more according to plan and we hit the summit at 0855. We had lunch and took pictures, then started down at 0920, reaching the car at 1035 and the hotel in Fonni at 1120 (being stuck behind a slow truck for most of the return drive). GPS measurements showed us that the big "silver" cross was not on the highest spot, but at the south end of the summit ridge. More precisely, the summit ridge stretches drom a high point in the north measured to 1831 meter, location N39:59.607, E009:19.523, via the summit with the big silver cross measured to 1833 meter at N39:59.383, E009:19.491 to the south point measured to 1836 meter at N39:59.272, E009:19.476. 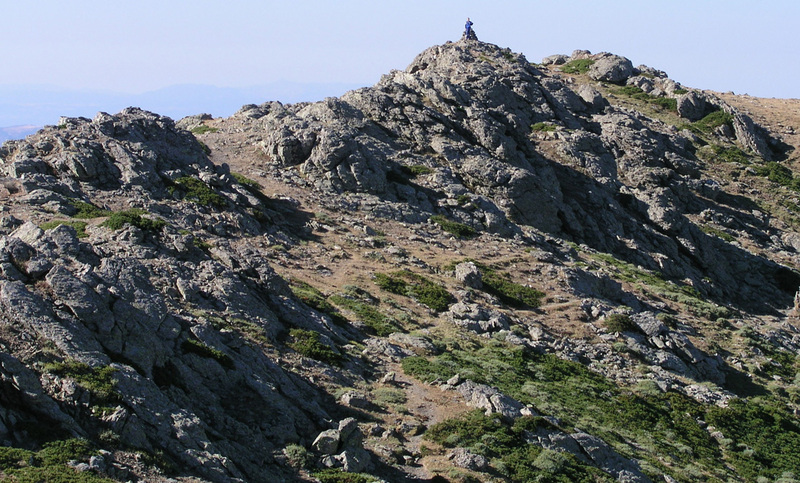 The question remains if the official height of 1834 meter is the middle summit and that Marmora may be a few meter higher than this. The M5 trip continued two days later with ascent of Etna, the HP of Sicily. Marmora as seen from the trail. Pål Jørgen at the true HP of Sardina. 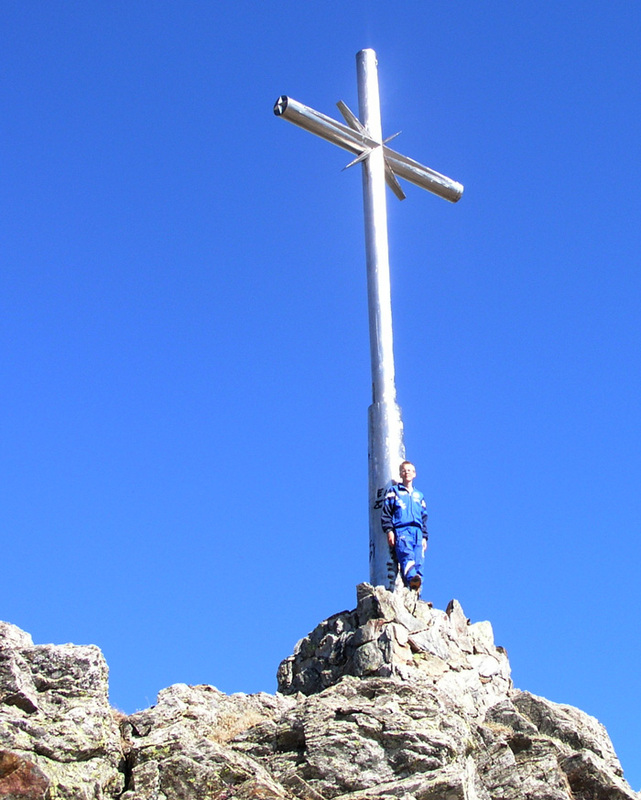 Pål Jørgen by the summit cross. Summit view, a look to the route of approach. Summit view, the neighbor top.